Day One of Lent… FAIL. You realise you’re going to hell for this don’t you? Our favorites, in no particular order, were/are: Mike Mulligan & His Steam Shovel, The Little House, and Katy & The Big Snow all by Virgina Lee Burton. Blueberries for Sal by Robert McCloskey (he also wrote Make Way For Ducklings), Golly Gump Swallowed a Fly by Joanna Cole, Go Dog Go! by P.D. 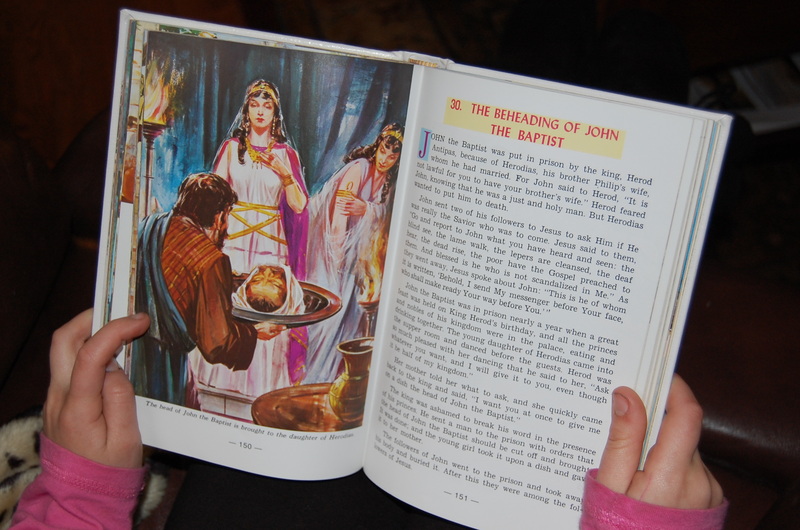 Eastman, and last but not least Noisy Nora, by Rosemary Wells… The first books were all books that my two older children loved… they could sit quietly & loved to have me read to them….. The youngest one? The Lego King?…. Ummm, not so much…. he could/can sit for 2.3 nano-seconds….. And loud?…. Good Lord!!! Noisy Nora is most definitely HIS book…. it’s a quick read about a little mouse who is very loud & bangs around alot… but when she leaves & the house gets quiet everyone misses her…. Oh…. 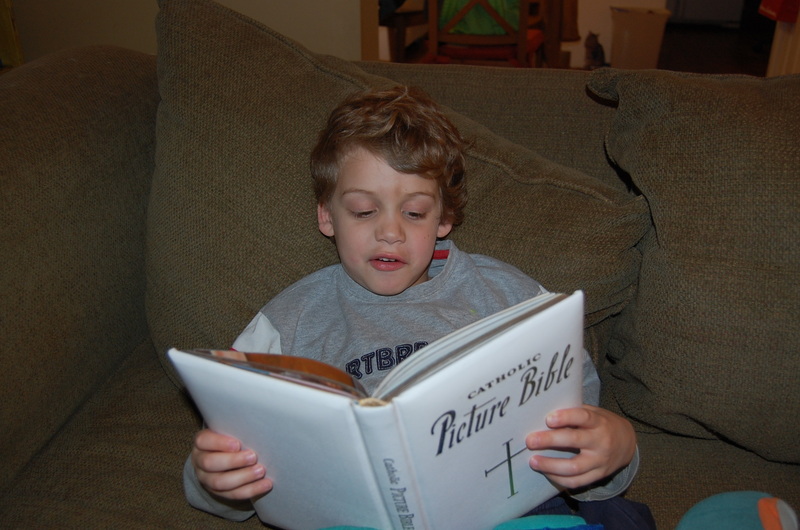 and the Bible pics? …. ROTFLMAO!!! It’s amazing how kids see something we don’t…..
Really? You would pass right over that and not say something? Hmm maybe I have a messed up way of looking at things and would have been kicked out of service as soon as I saw that because I would not help but bust out laughing. 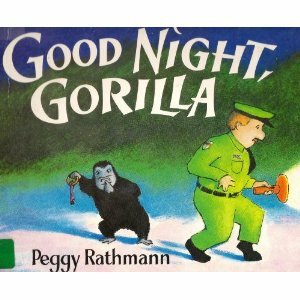 Goodnight Gorilla was my son’s favorite book, we read until it fell apart. You do animal sounds? Wait, I guess that really doesn’t surprise me. Actually, my dear, YOU are the one who bought Nature Boy our favorite children’s book of animal sounds about 10 years ago! That book would have made the cut, but I’m pretty sure Ike ate it and pooped out a whole family of hopping origami frogs. Ribbit! Oh those jammies… poor Ike. Is it any wonder he’s so naughty? Dressing one’s pets in organic Swedish pjs is the ultimate crime against nature. Love your stories, thanks for sharing them with us! We love Midas Mouse, Koala Lou, Baby Angels and can’t leave out Goodnight Moon. Oh I LOVE Goodnight moon! That one is so sweet. And the other one I love is Runaway Bunny by the same author. Of course, we make up our own verses for that one like “If you were a kitten, I would become a falcon and swoop down and grab you with my razor-sharp talons. Then I would rip out your innards and devour you using very poor table manners.” Okay, really only my 11 year old and I make up verses like that. He’s witty, that one. Blue Hat Green Hat is a favourite around here too. 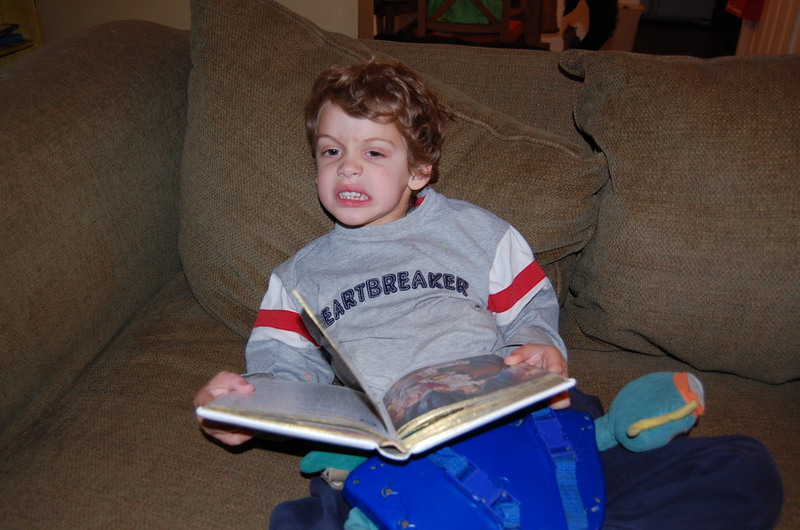 Love it when the kid does all the “oopses” – especially with a lisp. My kids like Pinkalicious. I am bored to tears from reading it so many times. Anything by Sandra Boynton is A-OK with me! The Going to Bed Book is one of my faves too. Also LOVE Night-Night, Little Pookie. Cute, funny, catchy, and tender. Don’t know any of the others on your list, but I do know Mo Willems (“Don’t Let the Pigeon Drive the Bus!”… hilarious!). Thanks for the recs, will check these out! Awesome! Once again you’ve made my day! And just for fun I will share our faves, and I’ll even through in my short reviews…for free. ~Not just for Halloween! 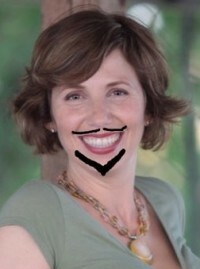 “She bakes me cookies filled with bugs and gives me great big hairy hugs…” Seriously? Whats not to love?!? ~There is a verse that needs to be sung rather than read, otherwise it loses something! I made up my own tune for it, and every now and then one of us will spontaniously break out in that song for no good reason at all….yeah, its that catchy! ~My 11 year old candidly pointed out that “This is the story of your life, Mom!” She’s right. I hafta’ love it now. ~ First of all, who doesnt love John Lithgow?!? And secondly, this book comes with a clear message to “Be Yourself” AND a CD! Oh yes, You too can listen to John Lithgow sing the story the way only he can…and you’ll be singing it over and over again, too! Warning: Extremely catchy tune! Great great great! Love this – I will check out every one of these based on your thorough and enthusiastic reviews! Thanks! I do loves me some John Lithgow. Oh his kids c.d.’s are so awesome. I sing “I’m g’not a g’nu every time I am at the zoo. 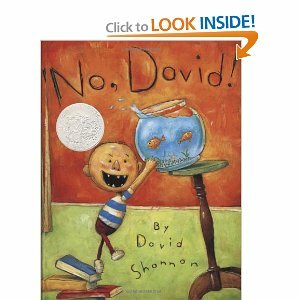 No David is probably Ally’s (granddaughter)favorite book. I read it multiple times to her the 8 months she and her mom lived with us. She would always kiss and hug the last picture….too cute… can’t wait for her to get here! 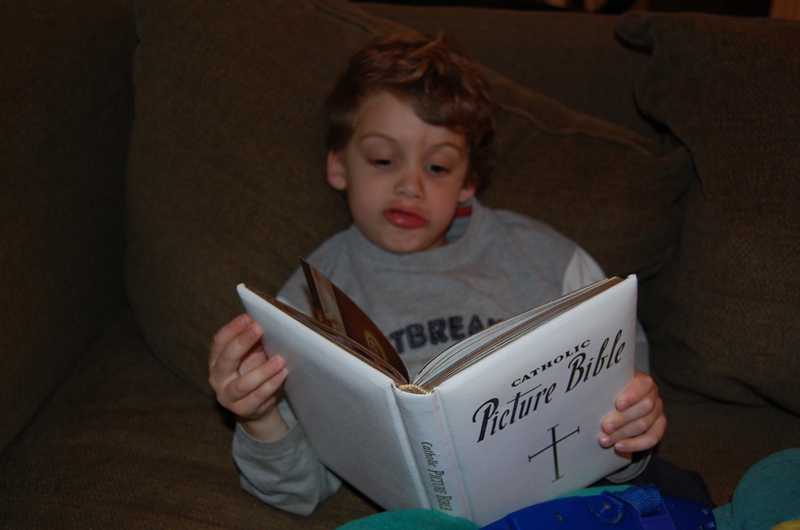 OK Iris, the Catholic Picture Bible is positively the biggest laugh I have had this week, in a week full of humorous moments looking after my parents and my best friend, who is my age but in the nursing home. I know that doesn’t sound funny, but trust me here, funny it has been. When I don’t want to strangle somebody, that is. I have so many good choices for children’s books that I don’t know where to begin. But mostly, they are books for reading aloud and that’s not really what you are looking for. But could I plug ‘Madeleine the Miracle Hen’? I don’t imagine it is still in print but does anyone else know it? I have a battered copy that I will photocopy and send if you are interested…Also, get your skates on and order the Country Bunny and the Little Gold Shoes! OMG, I missed this one the first time around. 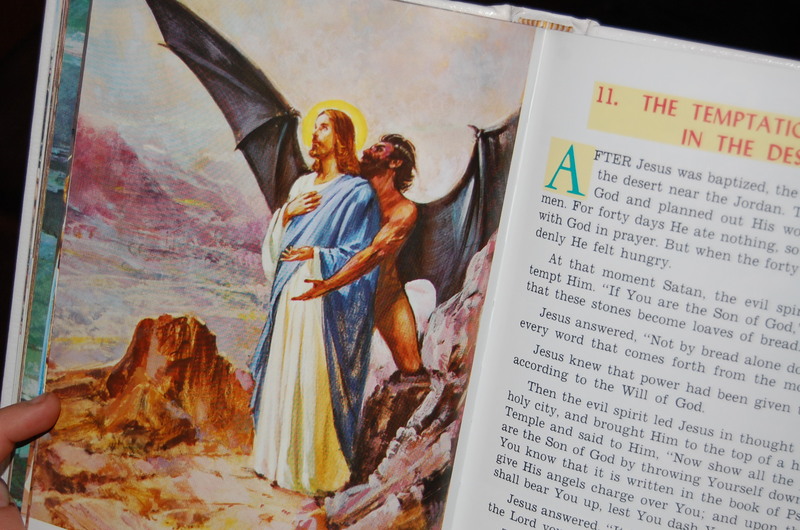 Naked Satan pressed up behind Jesus. It’s too much! The illustrator surely knew what this looked like, right? “Turn away from sin, kids, or naked Satan will bugger you!” might be my favorite sentence. Can I actually say this to my kids? “Don’t play with plugs, S or Satan will bugger you!” “Listen to me the first time or Satan will bugger you!” Oh, this is tempting indeed. It’s so messed up, isn’t it?! No wonder there are so many “recovering Catholics.” Hahaha! I just bumped into your blog, and found the Llama, Llama post, and cried I was laughing so hard. Then this with the Bible and reach-around nekked Satan with the feather fascinator. Oh, Lordy…I have to pee! The best page is the one about the chicken…”Because it might make life hard for a hen.” http://cluckydotcom.files.wordpress.com/2011/12/animals-should-definitely-not.jpg?w=225&h=300 I can’t eat an egg anymore without wondering if it was stuck in some hen’s flowered jeans. Oh heck, you’re a funny lady! 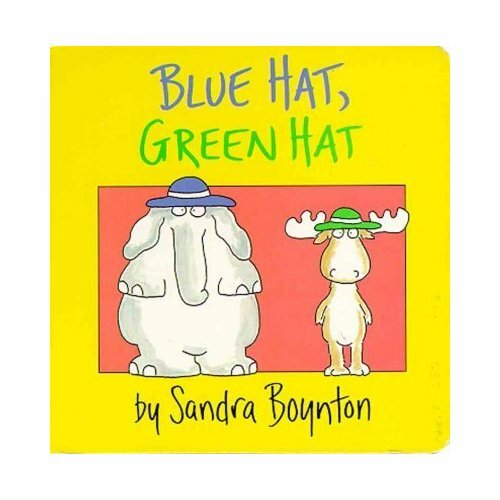 Red Hat, Green Hat (or whatever the color order goes) was the first book my son actually “got” the humor out of. He was about 2 and a half and he would ROLL with laughter. 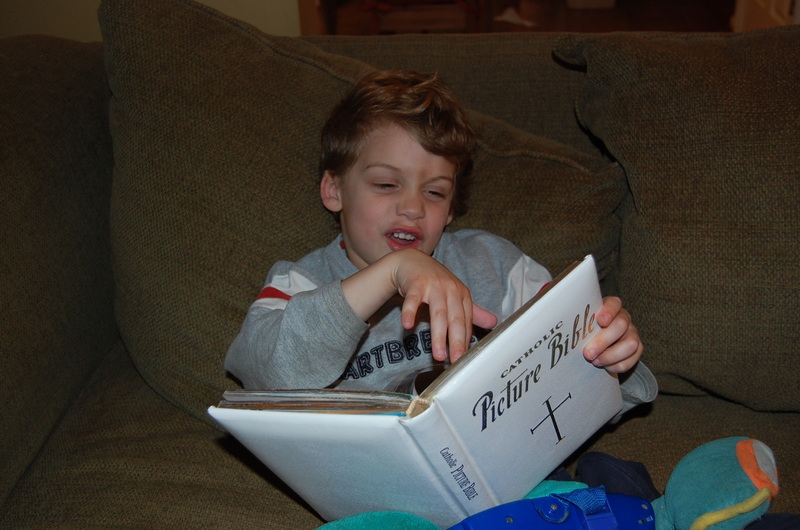 Too much adorableness – we read it to him over and over just to hear his breathless, hysterical giggle fits. He may have developed asthma over this, don’t know. 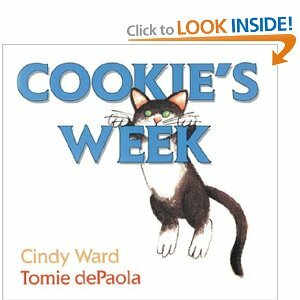 Incidently, I just recently learned Tomie dePaola is a MAN. This knowledge rocked me to my core. I had pictured him for 34 years of my 34 year old life, as a Tasha Tudor woman, complete with corgis and rubber boots and an apron. I cannot get over this. When I found out that Tomie dePaola was a man it freaked me out too! I pictured a round figured woman with long gray hair always worn in pigtail braids. Don’t know why. On the subject of his books…. The Legend of the Bluebonnet was always one of my favorites as a little girl. So I bought it to read to my then 2 year old daughter. I hadn’t read it in years….. We read it together as soon as it arrived. She became hysterical when the little girl threw her doll into the fire. It was a little too traumatic for her as she could not grasp the beautiful meaning of the sacrifice. Huge Mama fail! I felt awful and we put that one in a hidden spot to read again when she is older. 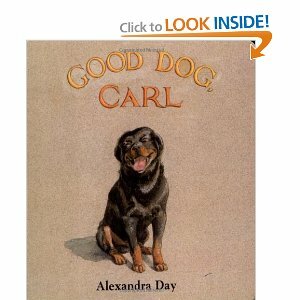 We love to read books together and I usually very selective with the books in regard to their content. Every now and then one slips through the cracks though and somehow becomes the one my daughter is attached to. Pinkalicious for example. I can’t stand that bratty girl!